The American criminal justice system consists of 2.2 million people behind bars, plus tens of millions of family members, corrections, and police officers, parolees, victims of crime, judges, prosecutors, and defenders. The Bronx Documentary Center and the Marshall Project are proud to present a video exploration and discussion of this timely subject. Jenny Carchman will present a collection of short videos from the Marshall Project’s We Are Witnesses, a video exploration of our criminal justice system. 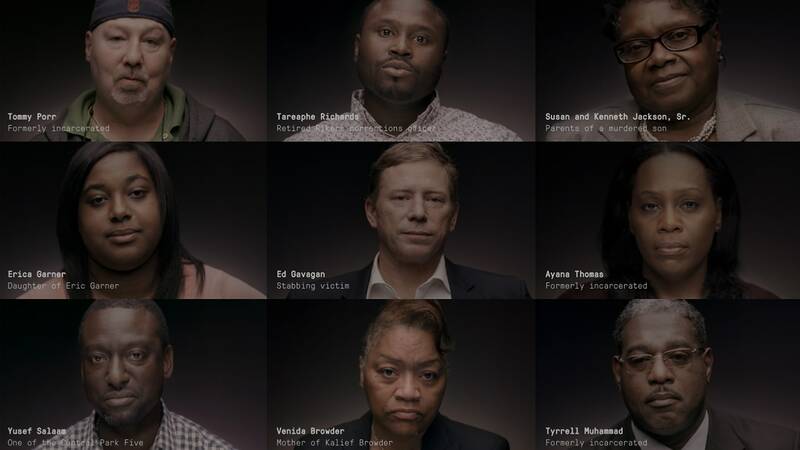 The video series features twenty people telling their stories — a crime victim, a corrections officer, a judge, a formerly incarcerated woman, a parent, a child, a district attorney and more. Joseph Rodríguez, acclaimed photographer and author of Juvenile, will present work from his multimedia project on reentry in Los Angeles. RodrÍguez’s project focuses on residents of Walden House, a drug and alcohol transitional treatment center that has been operating in California for over 40 years. Walden House has various residential and outpatient facilities throughout California, including in-custody treatment programs and services for people transitioning back into their communities. Jenny Carchman's We Are Witnesses takes a deeper look at the faces behind the complex and highly-flawed criminal justice system. For his project “Reentry in Los Angeles” documentary photographer Joseph Rodríguez worked with Walden House to produce photographs and interviews of its residents. During his time there, he witnessed various programs set-up to help residents recover and change their lives. JENNY CARCHMAN has made documentaries for both theatrical release and broadcast television, including PBS’s “Frontline,” “American Masters” and “American Experience,” as well as programming for HBO. Carchman helped produce documentary films for Academy Award-winning director Martin Scorsese (Public Speaking and George Harrison: Living in the Material World). She is the director of Enlighten Us (Mountainfilm 2016) and also directed the HBO documentary One Nation Under Dog. In addition to producing and directing films, Carchman serves on the board of directors of the Ghetto Film School. JOSEPH RODRÍGUEZ is an internationally recognized documentary photographer. In 2001 his website Juvenile Justice appeared in cooperation with Human Rights Watch and Pixelpress, exploring the lives of five adolescents and their struggle with the California criminal justice system. His project, Juvenile focusing on youthful offenders in Silicon Valley, was published by PowerHouse Books in 2004. Joseph teaches at New York University, and the International Center of Photography, New York. He has also taught at universities in Scandinavia, Europe, and Mexico. CARROLL BOGERT is the first-ever president of the Marshall Project. Bogert, who previously served as Deputy Executive Director for External Relations at Human Rights Watch and before that, as a foreign correspondent for Newsweek magazine, oversees the day-to-day operations of the Marshall Project, which covers criminal justice issues in the United States. The Marshall Project is a nonprofit news organization covering the U.S. criminal-justice system. They use award-winning journalism, partnerships with other news outlets and public forums to educate and enlarge the audience of people who care about the state of criminal justice. Suggested donation: $5 Bronx Residents, $10 General Admission, 18 and under Free. Tickets will be available at the door.